Your sales and profitability are not in line with your projections and goals. You’ve tried company-wide cost cutting and streamlined work processes. Departments have participated in continuous improvement discussions and plans. But, your expenses continue to mount. Your expenses are out-of-line with the current needs of your business. You may need to take action with regard to your largest expense, although also the most important investment and asset of your business: the people you employ. There are no good answers. Let's look at options and then acknowledge that workforce reduction might be the best answer. If you have employees with whom you have a contract, you can only implement these cost reduction measures by renegotiating the contract. This is also true when employees are represented by a union. The business justification for a workforce reduction, if a workforce reduction become necessary, should be documented. This means that an employer can provide evidence that alternatives to layoffs were considered or tried. If litigation results from a workforce reduction, this documentation is beneficial to show a jury that business reasons were the only consideration in the decisions about workforce reduction. One of the quickest steps to implement is to freeze hiring for all non-essential positions. This allows you to consolidate the employees you have to complete the work that is essential for serving the customers of your business. You can strategically continue to hire in areas where skills are difficult to find and in positions that will immediately generate revenue for the business. But, areas such as research and development may need to be placed on hold for the short term. Another component of a hiring freeze is to put filling positions that are vacated during the hiring freeze on hold if they are not essential. Another strategy to avoid employee layoffs is to freeze salary and benefit increases. This will be viewed as less stringent by the employees you really want to retain than some of the next options. Pledge to review this decision periodically and provide a time frame in which employees can expect an update. When business conditions are turbulent and unpredictable, it makes no sense to add additional costs to the permanent bottom line. Contract and temporary employees expect to be let go depending on the changing needs of the business. While this causes some turmoil in the lives of temporary employees, the employer does not have the same commitment to these employees as to regular employees. Temps provide a cushion of safety for the ongoing employment of regular employees. To avoid employee layoffs, let all contract and temporary staff go. Ask employees to take voluntary layoffs, offer a sum of money to end the employment relationship, or offer early retirement to eligible employees. All three of these actions give employees options and are viewed less negatively by the remaining employees. These options, while effective in cutting costs in the long term are expensive in the short term. A substantial sum of money is necessary to encourage employees to walk away from their jobs. In a voluntary layoff, no employee will volunteer without a substantial severance package or guaranteed return-to-work rights, usually within a specified time frame. In every organization, employees leave. Plan to save some costs as employees resign. Reasons range from a significant other's job change to family matters and new career opportunities. A voluntary quit may allow you to restructure your workflow. You may be able to transfer employees to different jobs. Only critical, essential positions should be filled. Keep in mind that in tough economic times, your attrition rate will likely slow. If you need to reduce employee pay, benefits or hours, think through the ramifications of this decision. 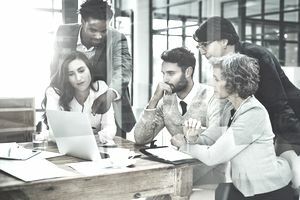 Your best employees, the employees you most want to retain going forward, the employees who are critical to your company’s future will be negatively impacted by the decision. And, these are often the employees who have options. Before considering this business decision, recognize that these actions may cause your best employees to leave. A furlough is an alternative to layoffs. In a mandatory furlough, employees take unpaid or partially paid time off of work for periods of time ranging from weeks to a year. The employees generally have either scheduled time off or call back rights and expectations. Examples of furloughs include closing a business for two weeks, reducing employee time on the job to three weeks a month instead of four, and asking employees to take two days a month off without pay. Other employees have been put on furloughs indefinitely. In a furlough, benefits usually continue, which is one of the differentiating factors from a layoff. Want an Older Employee to Retire? What Are Strategic Planning Pitfalls That You Will Want to Avoid? Want to Know How HR Can Do More by Doing Less?